Dinotopia: The Sunstone Odyssey is a 2003 action-adventure video game released by Vicious Cycle Software. The game is based on the Dinotopia book series. 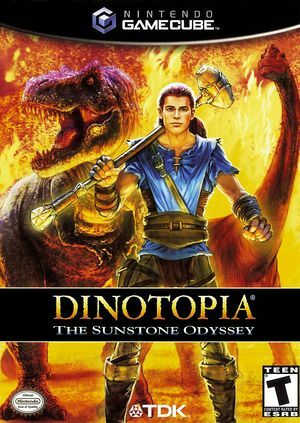 Dinotopia: The Sunstone Odyssey follows the story of Drake Gemini, his twin brother, Jacob, and their father, who have been stranded on Dinotopia for 10 years. At the beginning of the game, Drake and Jacob's father is attacked and killed by a rogue Tyrannosaurus while exploring the outer jungles of Dinotopia. After the killing, Drake and Jacob begin to go their separate ways, with Jacob joining a gang of dinosaur-hating humans called the Outsiders and Drake choosing to take on the role of a guardian of Dinotopia. In the game, you play as Drake. Sound is very odd when using HLE rendering, random audio samples seem to continuously play once other sound occurs. This can be resolved by using LLE audio. Refer issue 10753. The graph below charts the compatibility with Dinotopia: The Sunstone Odyssey since Dolphin's 2.0 release, listing revisions only where a compatibility change occurred. This page was last edited on 18 March 2019, at 08:48.